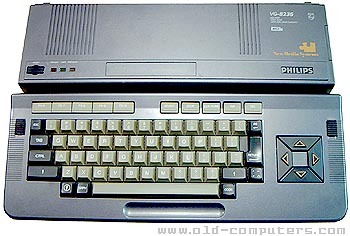 The Philips VG-8235 belongs to the MSX 2 standard. For its release, Philips presented the VG-8235 as the first link of their audio-video-micro concept, being able to use the newly announced CD-i system, but few VG-8235 were actually seen connected to a CD-i. It was the successor of the the short-lived VG 8230, wich only had 64K RAM and a single sided disk drive. Contrary to other MSX computers, the Philips used a custom chip for the sound instead of the "classic" Yamaha YM-2149. The computer could use all of its 128 KB memory, the MSX-2 standard allows a computer to have 4 slots, whish in turn can all have 4 sub-slots, which can each hold a memory-mapper, which can be up to 4MB in size. In theory, therefore, an MSX-2 computer can hold 4x4x4 = 64MB RAM. However, the system ROM etc usually needs a (sub)slot, and so do other peripherals. It was followed by the NMS-8245, a VG 8235 with a new case, no tilted keyboard and double-sided disk drive; then by the NMS-8250, an MSX-2 model with detached keyboard, the NMS-8255, same as the NMS8250, but with two floppy drives built-in, and the (legendary) NMS-8280, an MSX-2 computer with video-processing capabilities built into it. VG-8235 is one of the few MSX2 computers to be at least semi-widely distributed in Europe, mainly in The Netherlands. The machine is quite solidly built and the keyboard can be tilted between two different positions for better ergonomics. The only real problem is the disk drive which is single sided and can so only use half of the disks capacity. Most commercial disk based MSX2 software refuses to run on the machine for the same reason. The drive is also quite fragile and most of them are no longer in working condition. see more Philips VG 8235 Ebay auctions !